There are certain things — let’s call them “luxuries of the job” — that can make your writing pursuits even more enjoyable. In many cases, they can also make you more efficient, more comfortable, and more knowledgeable. 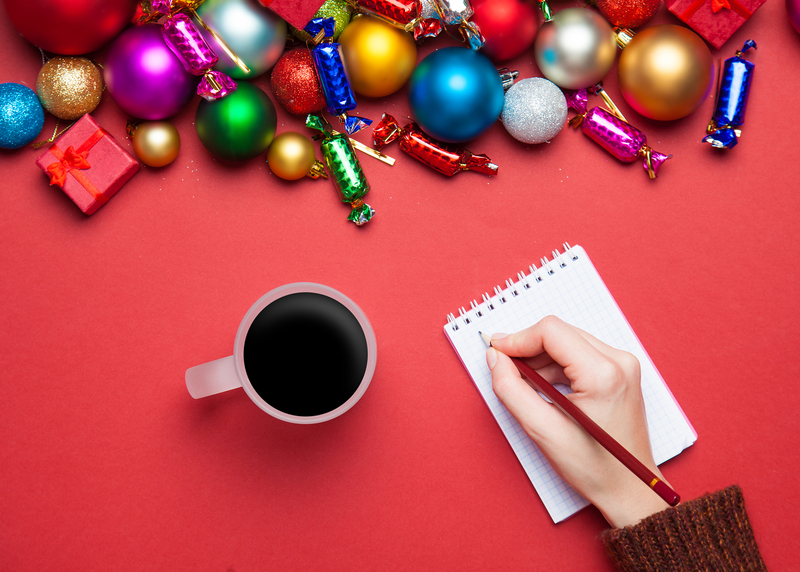 So with the help of Barefoot Writer, AWAI, and several other writers, I’ve put together this wish list of top gifts for writers. Most can be found on Amazon.com or with a simple online search. I’ve suggested a few links, but feel free to shop around. Calligraphy set. Great for ornamental lettering and details, calligraphy is a visual art that dates back to the fourth century. A useful gift set includes a pen, brush, and nibs of different sizes. And if you go with that, a great complement to this gift is the book, Creative Lettering and Beyond: Inspiring tips, techniques, and ideas for hand lettering your way to beautiful works of art. Stone paper notebooks. Also called rock paper or mineral paper, this tree-free paper is the stuff writer dreams are made of. Not only is it smoother to the touch, but the pages are durable, oil and tear resistant, and waterproof. Stone paper incorporates the aesthetic most writers associate with classic moleskin journals (also a great gift option). Stone paper is an environmentally-friendly option since the manufacturing process is free of chlorine, acids, and petroleum. As a bonus, it’s recyclable. Wax seal stamp set. The use of wax seals can be traced back to the earliest civilizations and have long served as a sign of indisputable authenticity — much like a signature is used in the modern world. If you want a break from the digital world where messaging is fast and fleeting, add a wax seal to your written communications to bring a touch of tradition, dignity, and prestige. Vintage typewriter. Plenty of writers believe in “setting the mood” for creative output. If you’re charmed by the history of the typewriter, you might enjoy setting up one of these odes to the past in a place of honor near your writing space. Fingerless writing gloves. Studies show people are more effective when they’re comfortably warm. Imagine how it might benefit your typing speed if you keep your hands and digits cozy, while leaving the tips of your fingers free to type. Fingerless writing gloves are available in every color and fabric, but if you love the story side of writing you might opt for themed writing gloves like this Jane Eyre version. Book scarf. While we’re on the subject of staying warm while writing and brainstorming, a book scarf may be more to your liking (especially if it inspires your creativity!). Here’s a Dracula Book Scarf to consider. Or, visit the Storiarts section of Etsy for an entire collection of book-themed gloves and scarves. Aromatherapy. Whether you go with scented candles, oil-infused bamboo sticks, or a room diffuser, the following scents are said to improve productivity: Citrus, jasmine, rosemary, lavender, and peppermint. Cobra Sit Stand Keyboard Tray. If you’re not ready to commit to full-time standing while working, a cobra-arm keyboard setup may be perfect for you. The tray holds a keyboard and mouse, while the arm adjusts the position so you can sit or stand while you work. As a bonus, the tray itself tilts up or down depending on your preferences. Standing desk. Standing while working and writing is not only healthier, it also makes it easier to stay focused (and awake!) for long periods of time. There are several versions of standing desks to consider, from the easily-mobile to the homemade (put a board on top of bricks and place on your existing desk). You might also consider the latest trend in fitness-working and think about a treadmill desk. Scrivener Writing Software. Whether you’re writing a lengthy sales letter, mapping out site content for a multi-page website, or storyboarding your next great novel, Scrivener can make that process easier. Scrivener is a powerful content-generation tool that helps you organize long and complicated documents. You can start with a free trial, or get your own software license for $45 or less. Evernote Premium. The Evernote app has long been a favorite of professional writers thanks to its intuitive process for remembering both large and small things. As it turns out, Evernote might help you be a better writer with these time-saving tips. And if you’d like to test it first before committing to a premium subscription, you can always opt for the basic (and free) plan to test it out. The ability to work from anywhere and pursue your passion. This isn’t something you can get from a store, and no amount of money could match its value. Our best advice is to set your goals as they relate to a professional writing career, outline a plan, and then share that plan with the people in your life who can help you make it a reality — maybe a spouse, a parent, or a friend. Reach out to your support system with your goals, but at the end of the day, remember: You’re the one (and the only one) who has the power to make it happen. And if you’d like to make it happen more quickly and you’re not already a member, join The Barefoot Writer Club. Rock-solid insight into persuasive writing. Copywriting is the foundation of just about every writing opportunity we feature here in Barefoot Writer. Understanding this writing craft can give you firm grasp on the powerful techniques that have launched lucrative careers for hundreds of other Barefoot Writers. Even if you’re not interested in becoming a professional copywriter, the selling and marketing knowledge you’ll gain from this program will help you in any business you choose to pursue. 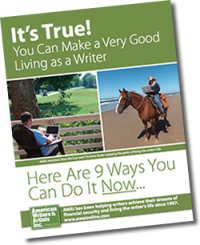 Discover these writing secrets with The Accelerated Program for Six-Figure Copywriting. If any of the items on this list resonate with you, you can access the extended PDF version at the top of this article. Then email it to the gift-givers in your life … or print it and leave it lying around the house … or share it on your Facebook page. You never know who might take note and send you a gift that not only makes your day, but also gives your writing career a boost!